Using named day delivery: Order this product within 5 hrs and 7 mins for guaranteed Saturday delivery. 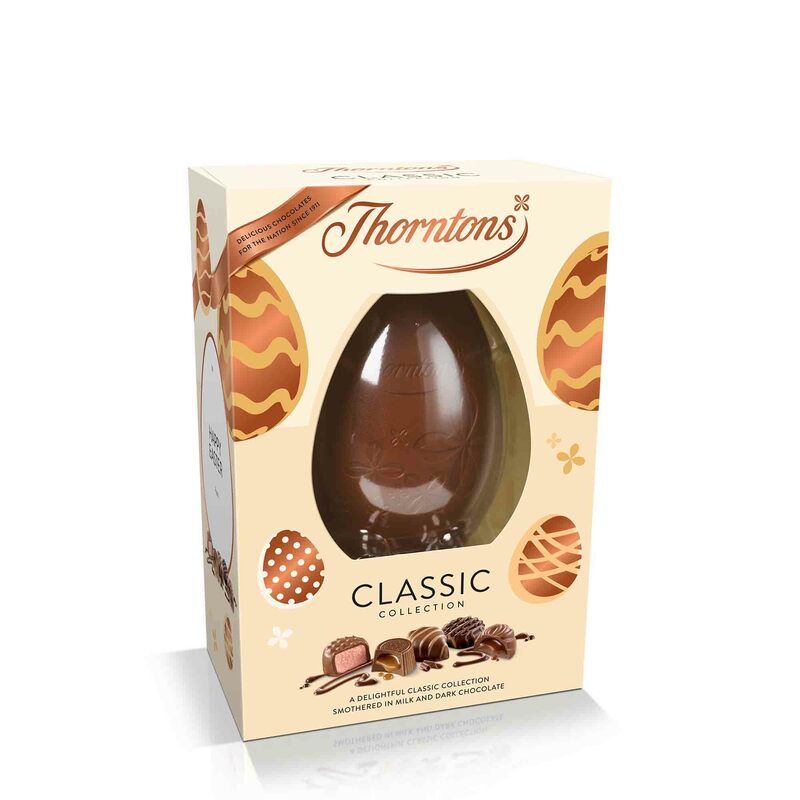 Bursting with flavours from Thorntons Classic Collection, this sumptuous Easter egg is sure to delight your loved ones. 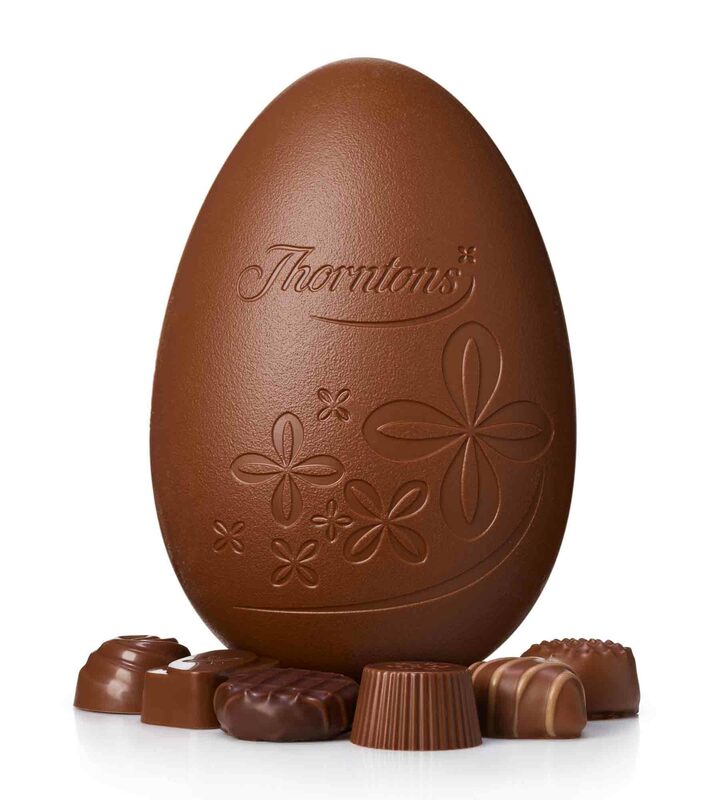 Here at Thorntons’ we pride ourselves on our personalisation - we’ve been hand icing our chocolate since 1922! Why not make your Easter gift even more thoughtful with a message of your choice added for your loved one. Please note that all icing is done by hand and we are unable to include text and chat abbreviations such as <3 and (:-) or :-*. Sugar, dried whole MILK, cocoa butter, cocoa mass, glucose syrup, MILK fat, butter (MILK), sweetened condensed MILK (whole MILK, sugar), palm oil, dextrose, coconut oil, emulsifiers (SOYA lecithin, E471, sunflower lecithin), HAZELNUTS, whole MILK, humectant (sorbitol), double cream (MILK), invert sugar syrup, single cream (MILK), maize starch, flavourings, gelling agent (pectin), strawberry powder, salt, acid (citric acid), fat reduced cocoa powder, colour (anthocyanins), acidity regulator (sodium citrate), dried EGG white, margarine (palm oil, rapeseed oil, water, flavouring, vitamin A, vitamin D), MILK protein, raising agent (sodium bicarbonate).